Twenty knit poncho designs that “could fit right into the pages of Vogue, Nylon and Lucky,” complete with “fashionista photos” and “clear instructions” (Publishers Weekly). Whether worn as a beach cover-up or donned as an elegant evening wrap, ponchos are everywhere. Now, with Viva Poncho, knitters can make the newest sartorial sensation their own. This fun, fresh book offers 20 poncho designs for every season and in every style--serapes, raglans, wraparounds, semicircles, rectangles, pullovers, capelets, and even a dog poncho. Patterns suitable for both beginners and experienced knitters are included, all accompanied by clear, easy-to-follow explanations. Simple to make and give as gifts (since sizing is easy), practical and stylish to wear, and suitable for all sorts of creative adaptations, ponchos are an ideal project for every knitter. In fact, the authors encourage customization, showing how to add a hood or a collar, or devise personalized color schemes. 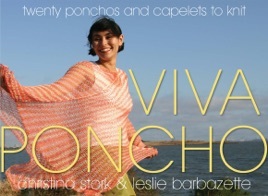 Like the fashionable garments themselves, Viva Poncho will be the perfect impulse buy. Easier than a sweater, harder than a scarf, ponchos are the perfect in-between knitting project-they're also incredibly fashionable. That must be the reason why so many of Stork and Barbazette's designs look like they could fit right into the pages of Vogue, Nylon and Lucky. Take the two-piece rectangular poncho "Sonya," for example; cast loosely with superfine wool in cheery summer colors, it's the perfect accessory for a day at the beach. Need something warmer for winter? Try the one-piece raglan poncho "Eleanor," knit in a bulky alpaca-and-wool blend with a turtleneck and a pretty cable running down the front and back. For fancy nights, there's the one-piece caplet "Eloise" knit in a satiny black "faux fur" wool and tied with a pink ribbon. Stork, the owner of Article Pract, a "yarn shop for modern knitters" in Oakland, Calif., and Barbazette, founder of the accessories line Citizen Bags, provide plenty of advice for beginners, including tips for knitting with circular needles, dropping stitches on purpose and weaving in the ends as you go. A helpful chart at the beginning also lists the skills needed and taught within each of their 20 designs. With its fashionista photos, hip designs, clear instructions and reasonable price point, this volume is sure to have widespread appeal.